An August report by QUEST B.C. shows that “BC’s 190 local governments are demonstrating remarkable momentum on ICES as are many First Nations”. 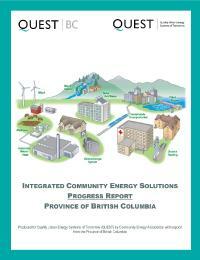 Integrated Community Energy Solutions (ICES), are defined as initiatives “to meet energy needs at the community level by taking an integrated approach across the historical silos of Land Use and Community; Housing and Buildings; Local Community Services, Transportation, Energy Supply and Distribution and Industry.” The report provides details and case studies of energy efficiency initiatives in B.C. in areas including infrastructure, waste management, building codes, and vehicle emissions, and lists the legislative, regulatory, and policy tools that have enabled them. Although many metrics are well-developed, the report recommends improved measures for the economic development impacts of the energy efficiency initiatives.Read Integrated Community Energy Solutions Progress Report Province of British Columbia at: http://questcanada.org/sites/default/files/publications/ICES%20Progress%20Report%20-%20Province%20of%20BC.pdf. Quality Urban Energy Solutions for Tomorrow (QUEST) is a national non-profit organization with provincial caucuses; its mission is to advocate for ICES; see http://www.questcanada.org/. For more on this theme, see Ellen Pond’s September 13 blog, British Columbia Needs local Government Innovation to Meet its Climate Targets at Pembina Institute at: http://www.pembina.org/blog/749. This entry was posted in Uncategorized and tagged Aboriginal Peoples, British Columbia, Building Codes, Community benefits, Community Integrated Solutions, First Nations, ICES, Municipal Government, Transit, Waste management by elizabethperry493. Bookmark the permalink.